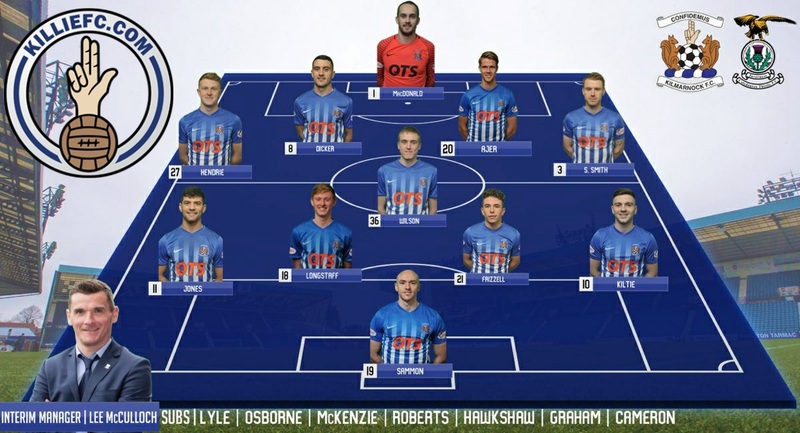 Jamie MacDonald, Luke Hendrie, Kristoffer Ajer, Steven Smith , Gary Dicker, Iain Wilson , Jordan Jones, Adam Frizzell, Greg Kiltie (Rory McKenzie 77), Sean Longstaff, Conor Sammon. Subs Not Used: Curtis Lyle, Karleigh Osborne, Cal Roberts, Dean Hawkshaw, Innes Cameron, William Graham. Lee McCulloch was forced into three changes for ICT’s visit to Rugby Park this weekend. England goalkeeper Freddie Woodman is away on international duty which means we have seen the last of him (for this season, at least), almost ever-present Greg Taylor was suspended and columnist Kris Boyd was away having an operation on his knee. Brought in from the cold were Jamie MacDonald, Greg Kiltie and Adam Frizzell. Club Captain Smith moved to left-back to cover for Taylor, with Frizzell taking Smith’s role in midfield. Sammon was moved to Boyd’s position on his own up front with Kiltie taking Sammon’s vacated position. ICT were desperate for a win due to them being four points adrift of nearest rivals Motherwell and Hamilton. 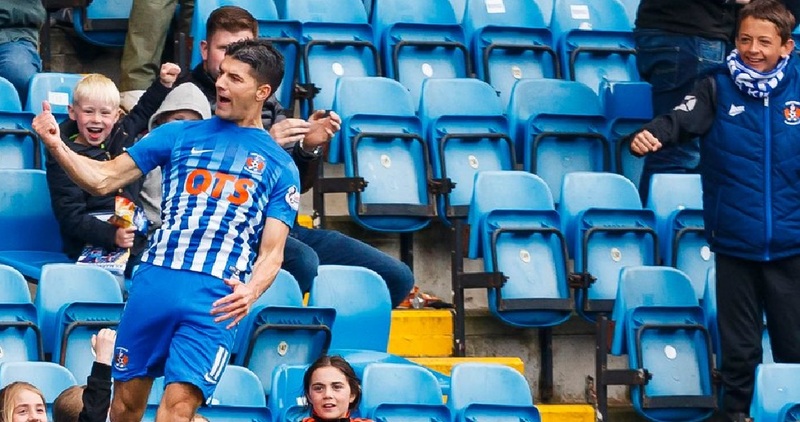 Killie were looking to seal their place in the top flight for the 25th consecutive year, a point looked to be enough for the oldest professional club in Scotland. That being said, it was ICT who started on the front foot. A delightful defense splitting pass sent Fisher through on goal and if it wasn’t for poor finishing, Killie would have been 0-1 down. Four minutes late and Killie’s defense was bypassed again, this time with McKay getting a shot at goal from just outside of the box. However, once again, ICT’s shooting left a lot to be desired. From there, the game became a little scrappy, with referee Cheating Beaton happy to blow his whistle at every possible moment. One such moment led to a triple booking. Iain Wilson lost control of the ball, and then lunged at Draper who was collecting. Wilson won the ball but smashed through Draper in the process. Draper stayed on the ground, Wilson got up only to be met by an enraged McKay who, in turn, was confronted by Killie Captain Smith. Beaton decided that the tackle was worthy of a booking. Smith and McKay were also booked for getting involved. 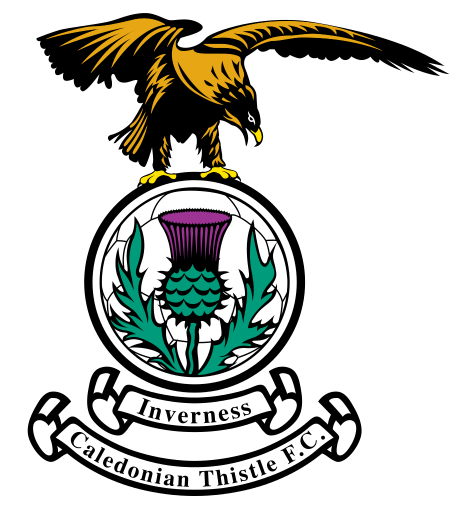 Inverness were punished for their poor shooting on the 17th minute. Killie were awarded a corner after some poor defending from ICT. It was clear that this corner was another from Peter Leven’s Big Book of Wonderful Plays however it didn’t quite pan out as expected. As most players crowded around the keeper, Jones played the ball out to Smith on the corner of the box. He was closed down quickly and his cross flew up into the air. Esson looked odds-on to collect but he hadn’t prepared for Frizzell to get under his feet. Esson spilled the ball which fell kindly to Longstaff at the edge of the box. His characteristic drilled shot (right) was on target and made its way into the net, despite the best efforts of the ICT defense. The rest of the first half was very scrappy with Killie resorting to long high balls to Sammon, who was constantly fouled with no intervention from Cheating Beaton. ICT, on the other hand, were woeful in their passing and were constantly caught out in midfield due to the dynamism of Adam Frizzell. Killie fans were “awarded” with four shots from outside of the box from Longstaff (2), Frizzell and Jones. However, all of them were off-target. Meanwhile, Inverness fans were awarded with the same outcome from a Mulraney shot from outside the box. Foran tried his best to make positive changes for ICT at half-time. Iain Vigurs came on for the ineffective Jake Mulraney as Caley tried to push Killie for a much needed equaliser. 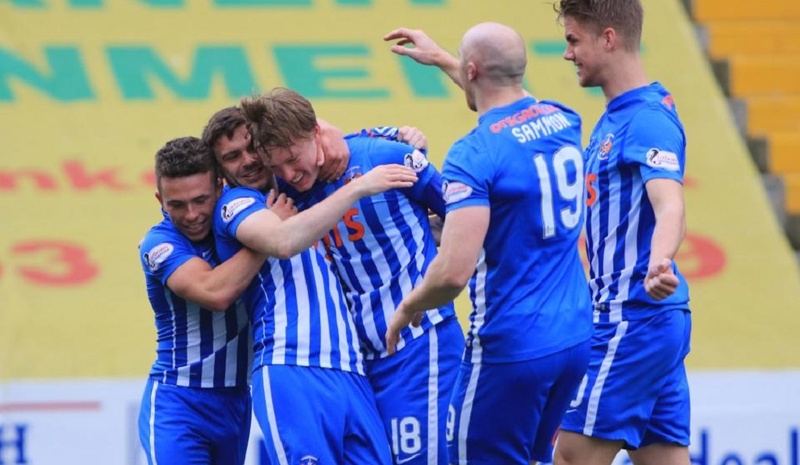 However, Killie got a better hold on the game in the second half, with Frizzell, Kiltie and Jones excelling in the midfield and Ajer performing at his usual best at the back. 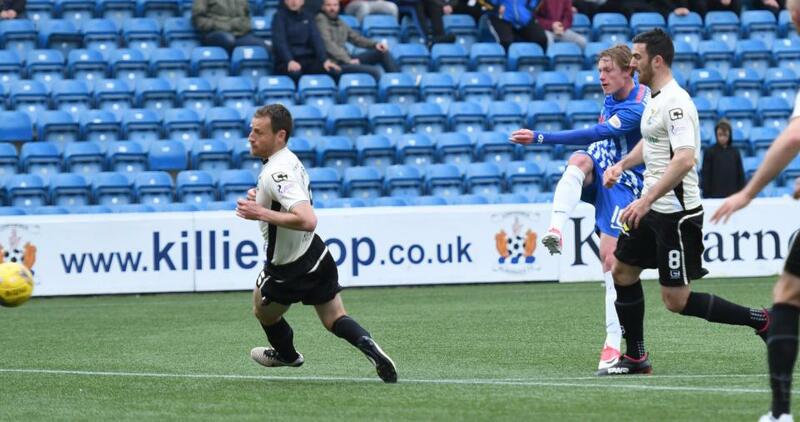 Jones had the Caley right-back on toast and managed to make the by-line four times in the second half, but his cut-backs and crosses were never met in the box and often rolled out for a throw-in. In the first ten minutes of the second half, Longstaff had another off-target shot, and McKay forced the first save of the game from Jamie MacDonald who got down well to his left and held convincingly (on the note of holding convincingly – where is Samson these days?). Soon after, Killie were 2-0 up and looked to be winning convincingly. Frizzell collected in the middle of the park and played a micron-perfect pass to Jones who was marauding down the left wing. Jones (right) turned his marker inside out before strolling into the box and passing the ball past the flailing Esson. Foran immediately replaced Polworth with Anier as ICT started to push more and more men up top. However, the next fifteen minutes belonged to Killie and Kiltie, Jones, Frizzell and Longstaff ran amok. Both Jones and Longstaff had chances to put the game to bed but Jones shot wide and Longstaff’s shot was blocked. Meanwhile, Jones’ cutbacks from the by-line were not being met with oncoming Killie players. Inverness were getting desperate and McKay should perhaps have done better from his free header in the box and his shot which was well blocked by Ajer. Foran’s desperation led to his third and final substitution in the form of Cole for Draper. At least Cheating Beaton’s ears would have earned a respite from Draper’s constant moaning. However, Cole made an immediate impact for Caley. His twists and turns had Hendrie all over the place and it is a wonder why he wasn’t in the starting eleven for the highlanders. Cole collected the ball on the left wing and after a few twists and turns, he fed the ball to Vigurs. Vigurs in turn split the static Killie defense with a pass to Alex Fisher who coolly slotted past MacDonald. Cue squeaky bum time. 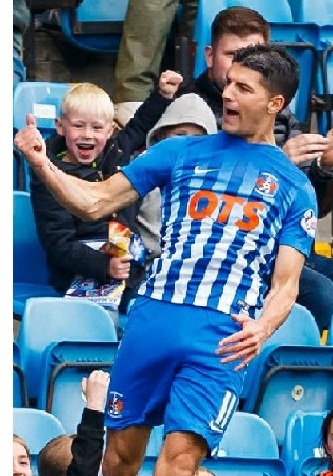 Caley smelled blood and hit Killie with everything they had. In the next five minutes McKay had a lobbed shot which went narrowly wide and Raven forced MacDonald into another fine save. Killie interim manager McCulloch realised that Kiltie was wilting and replaced him for McKenzie for more grit in the midfield. McKenzie had a great opportunity to put the game to bed, but the ball got stuck under his feet at the worst possible time and still ICT ploughed on. In the final ten minutes, Caley had shots from Raven, McKay and Vigurs and another free header for McKay. However, due to a combination of poor shooting and some good goalkeeping (welcome back Jamie! 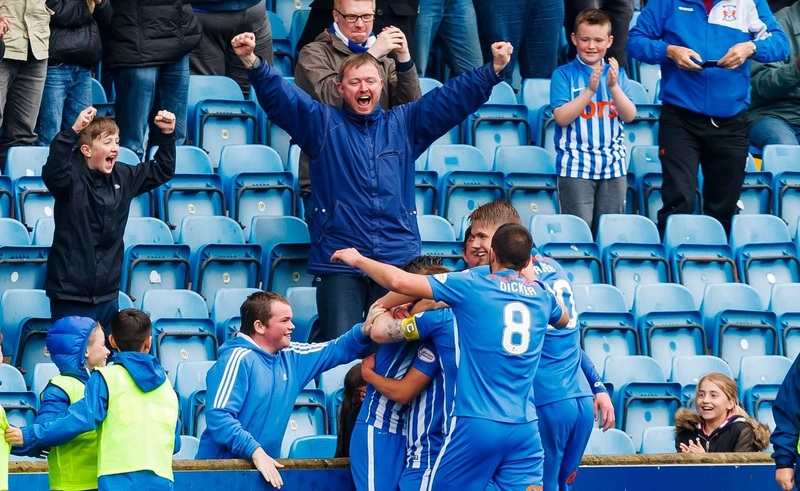 ), Killie held firm for an essential three points. Killie are now “best of the rest”, one point clear of Ross County and four clear of Dundee with six points to play for. 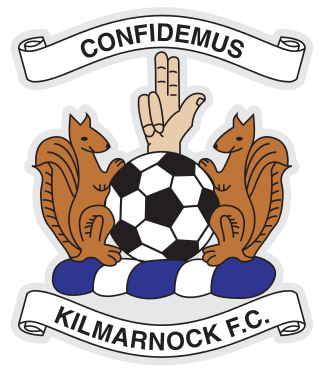 Next up for Killie is a midweek jaunt to Motherwell, who are still desperate for points. However, their pressing play might be ideal for Killie’s counter-attacking strong away set-up. You’ll never know, unless you go! Lee McCulloch: "It was a wee bit nervy in the last 15 minutes but compared to last week, it's massive. The dressing room are together, they're with each other and believe in what myself, Peter (Leven) and Paul MacDonald are trying to do. Now we are safe we can enjoy it, but we look forward to a tough game on Tuesday. Jordan [Jones] can be frustrating but when he's on it, he can go to any level he wants to go to. We've spoke to him about it. As long as he stays dedicated and doing the right things away from football, which he does, he can go far. Adam Frizzell coming in, having not played for a while, putting in a performance like that was brilliant to watch. I see him in the middle - he needs to be on the ball a lot. Greg Kiltie is still not match-fit so we need to get him game time but I thought big Conor (Sammon) worked really hard, too."